Cavern of Confusion (まいごの どうくつ?) is the second area in Hey! Pikmin. 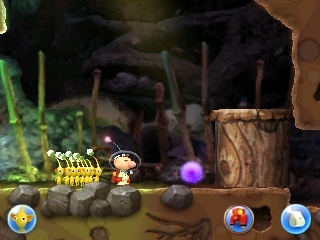 It takes place inside a cave with shifting parts, and introduces the player to Yellow Pikmin and their ability to be thrown high. Near the end, there is a large wooden stake that blocks the way to the secret exit that leads to the Cherrystone Pass. If the player doesn't have enough Pikmin to stomp down the stake, they will have to take the standard exit to the Mushroom Valley. This area takes place in a big cavern. Right at the start, there is a bush, that serves as a nest for Yellow Pikmin. After going down a vine, Olimar finds some Yellow Pikmin that are threatened by a Spornet. In this area, the player has to be very cautious with those enemies, because there are a lot of them. The area is also made up of patches of ground that go up and down when stepped on. There are also wooden stakes, that need to be pushed down into the ground in order to progress in the cavern. The first treasure to be found in this area is the Consolation Prize, alongside two Mockiwis. Not too long after that, the Ultra Sealed Aquarium can be taken. As the player progresses in the area, there are more and more Spornets, thus making it through the cavern harder without losing Pikmin. Some fragments have to be retrieved, in order to make a bridge and continue the cave. Just after the bridge, the Peace Missile can be brought back to Olimar. The player whistles the Pikmin hiding behind leafs at the start of the area. 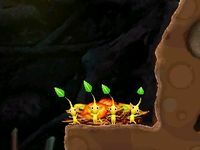 The four Yellow Pikmin hiding behind the leafs pop out with backflips and perform a pose. The player enters the room after the first vine. 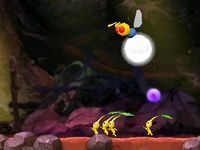 Four Yellow Pikmin appear running away from a Spornet's shot, right to left, then left to right, and then right to left again. The Spornet leaves after this third time. The player walks a bit forward after the doorway beyond the bridge room. 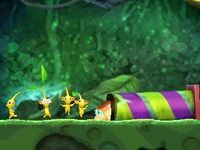 Four Yellow Pikmin idle by a colorful tube. One crawls inside, and a bit after, quickly scurries back out. It stops some distance away from the tube, looks back in horror, and the three wonder what's wrong. A Crumbug then crawls out of the same tube. The four Pikmin run away as the Crumbug tries to bite them, before turning the opposite direction and walking off. To do: Add a guide on how to clear the area. A sleeping Mockiwi and the Consolation Prize. One of the shafts with a collapsible floor. The path to the right of the shaft in the previous image, with the Ultra-Sealed Aquarium. A passageway to a secret room. The room with the Peace Missile. The wooden stake that blocks the secret exit. This page was last edited on February 21, 2019, at 17:24.